Metro-style Lucky Club Casino is giving casino bonuses up to $1000 that include up to 75 free spins during its Summer Party Fever casino bonuses event. You can choose bonuses with low play-through or, if you prefer, choose bigger bonuses that include even more free spins. These bonuses, all valid until July 31st, can be used once per week until then. Lucky Club Casino has dozens of unique games from Nuworks Gaming and welcomes players from all over the world. Three of its most popular slots are giving double comp points throughout July. Everyone playing African Skies, Babushka, and Fire, Wind & Water this month will earn comp points twice as fast as usual. 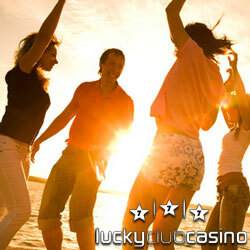 Double comp points on three featured slot games this month.